I am the above mentioned person living at the address previously supplied to police. I am a GP at the Center for Health at Syston and my qualifications are as follows: MB, CHB, MRCGP. I have practised my profession at this location for 22 years. 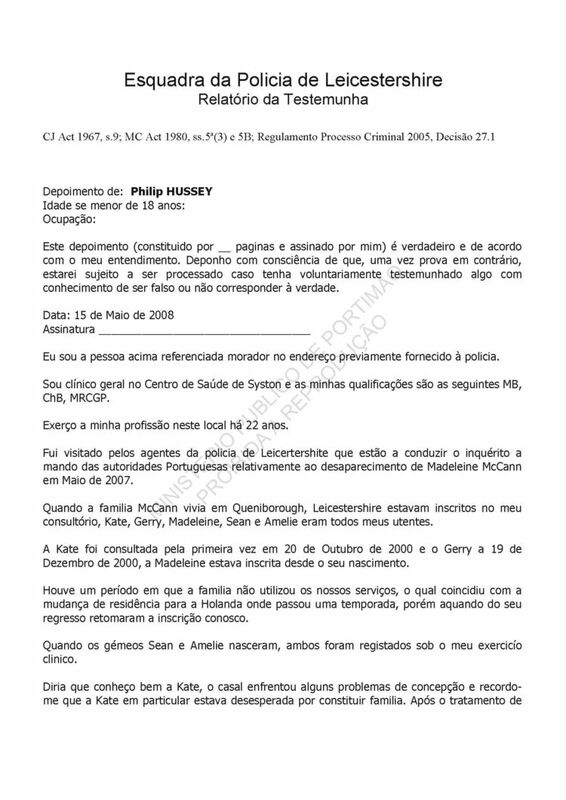 I was visited by police officers from Leicestershire who are conducting an investigation by order of the Portuguese authorities regarding the disappearance of Madeleine McCann in May 2007. When the McCann family lived in Queniborough, Leicestershire they were included in my consultancy; Kate, Gerry, Madeleine, Sean and Amelie were all my clients. 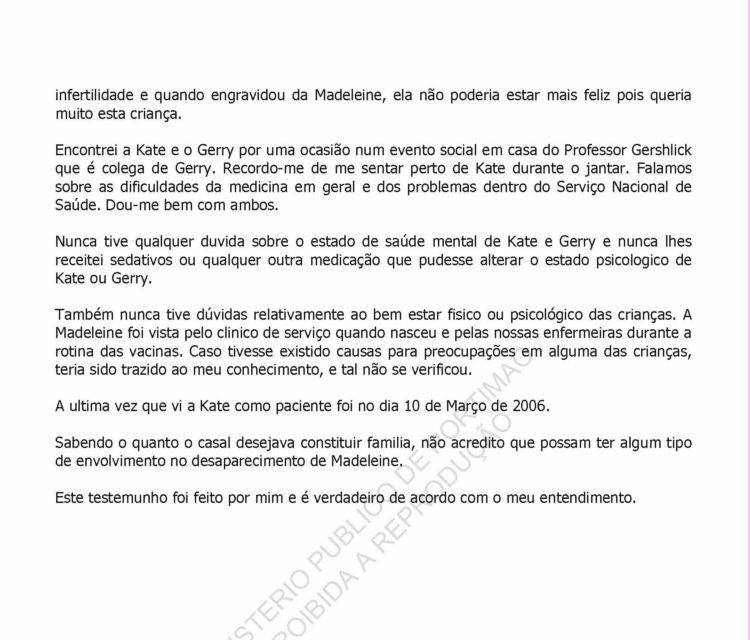 Kate's first consultation was on 20 October 2000, and Gerry on 19 December 2000, Madeleine was included since birth. 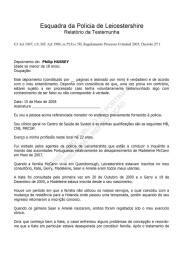 There was a period in which the family did not use our services, which coincided with the change of residence to the Netherlands where he spent a season, but upon their return resumed their affiliation with us. When the twins Sean and Amelie were born, both were registered in my clinic. It could be said that I know Kate well, the couple faced some problems of conception and I recall that Kate was particularly desperate for a family. After treatment for infertility and when pregnant with Madeleine she could not be more happy because she wanted that child so much. 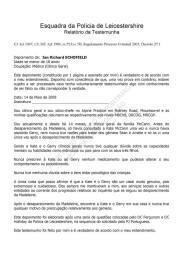 I met Kate and Gerry once at a social event at the home of Professor Gershlick who is a colleague of Gerry. I remember sitting close to Kate during the dinner. We spoke about the difficulties of medicine in general and of the problems within the National Health Service. I got on well with both of them. 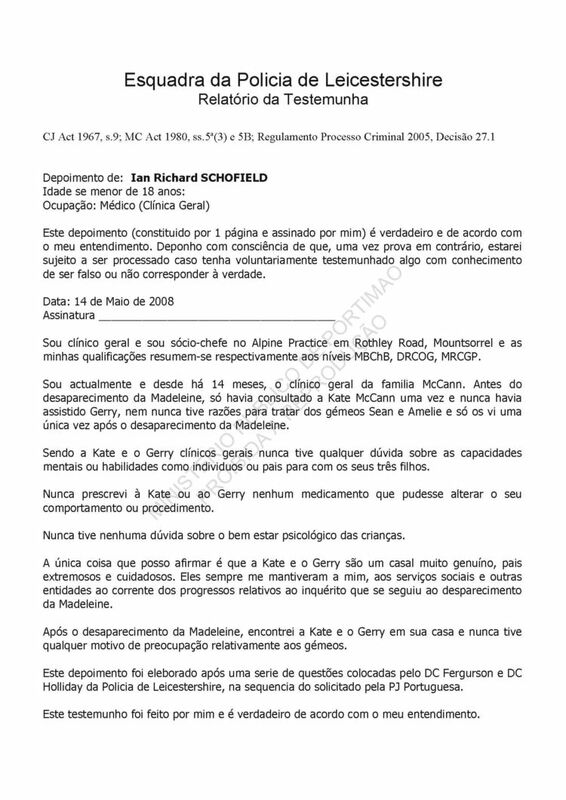 I never had any doubts about the state of mental health of Kate and Gerry and I never prescribed them sedatives or any medication that could alter the psychological state of Kate or Gerry. Also, I never had doubts regarding the physical or psychological well-being of the children. Madeleine was seen by the duty doctor when born and by our nurses during the routine vaccinations. If there had been cause for concern in any of the children, it would have been brought to my attention, and this did not happen. The last time I saw Kate as a patient was on March 10, 2006. Knowing how much the couple wanted a family, I do not believe that they would have had any kind of involvement in the disappearance of Madeleine.